Video documentation of an installation by Tal Gilboa and Ali Minaui. The truth is that only few know about the existence of a little brain in each one of the fingers, somewhere between the central joint and the nail joint. The other organ which we call brain, the one we were born with, the one that bounces inside the skull and that bounces us so that we would bounce it back - had never managed to create but vague intentions, general, blurred and especially not so varied about what the hands and the fingers should do. 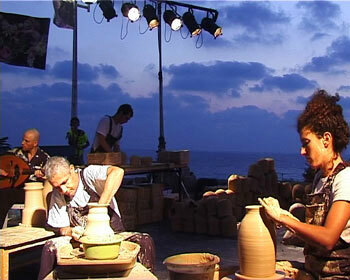 Tal and Ali, two potters, Jewish and Arab, create together hundreds of pots during three days of hard labor. 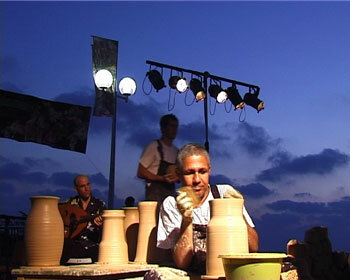 The fragile pots made out of clay are the building stones for a new building that would stand still in the end of the festival. Just like a home contains a whole world within it, such vessel is a pot, and both are actually built from earth or dry clay. The artist who usually sits alone in the studio working hours and hours - comes out to work in the street in front of the wide crowds. The dialogue between the two artists is a testimony to our shared life in here and it intensifies our will to build and not to destroy.